Web Components is a technology I’ve been excited about for years. The idea is that you can create your own UI components that are supported in the browser regardless of which framework you are using (or none at all for that matter). However, there wasn’t much traction around them until recently. The web components APIs are pretty low level by themselves but projects like Polymer are trying to improve the developer experience and recently more tools came along to help with authoring web components. One of these tools is Stencil from the Ionic team. If you are not yet familiar with web components, I suggest you check out this short introduction on webcomponents.org to get an idea of Custom Elements and Shadow DOM. If you want to have a better idea of why web components might be of interest for you, even if you don’t author a UI framework for the public, check out this talk Alexander Zogheb on how they used web components at EA. In this blog post we’ll look at how we can develop a web component using Stencil, publish it to npm and consume it on a website. We’ll develop a progress bar component called my-progress-bar that will allow us to pass the current value and optionally a maximum value as well as a “styling API” to alter the colors. Before we get started make sure you have Node.js and npm or yarn installed. In this configuration we specify the namespace in which Stencil will bundle all components as well as which components to place into bundles. Additionally we specify that we want to generateDistribution to make sure that Stencil generates files for us to distribute our component and disable generateWWW. This option is used if you would want to build an entire application using Stencil. Now that our setup is completed, it’s time to write our first component. For this, we’ll have to create two new files. One is a stylesheet to style our component, and one is a TypeScript file with our template and logic in it. 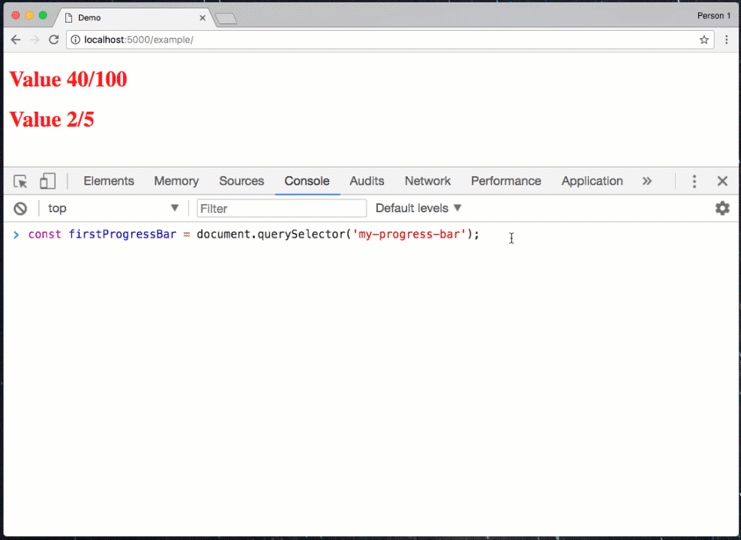 Since we specified in the stencil.config.js file that our component is called my-progress-bar, we’ll have to create the files under the respective file path and file names as Stencil relies on a specific file structure. This creates a very basic component. The @Component() part in front of the class definition is a decorator that adds metadata to our class so that Stencil knows how to create this web component. In it we specify a tagName – this is the name we can use later in our HTML document to create such an element. In our case this would be . For forward-compatibility reasons we always have to use a - in the name of a custom element to not interfere with built-in elements. We specify the path to our stylesheet using styleUrl and the last thing is shadow: true. 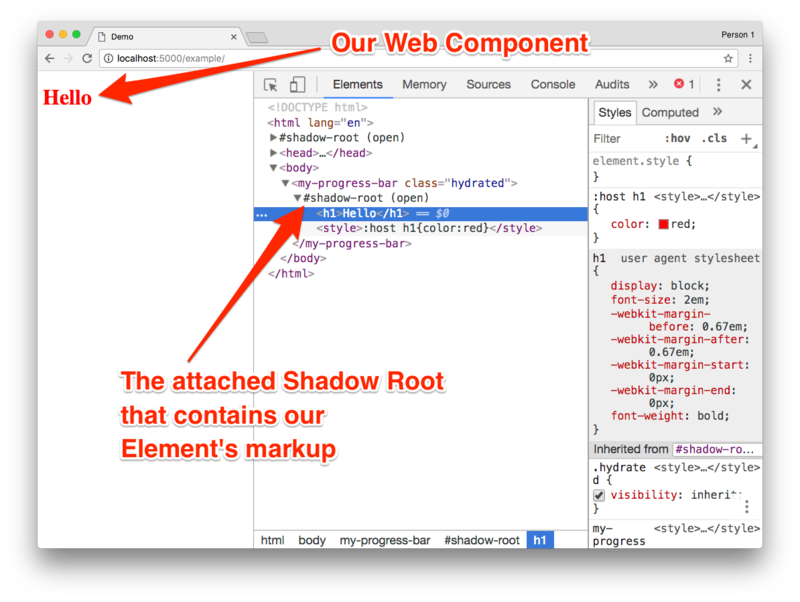 This will tell Stencil that we want the content to be wrapped into a “shadow root”, aka use the Shadow DOM API. 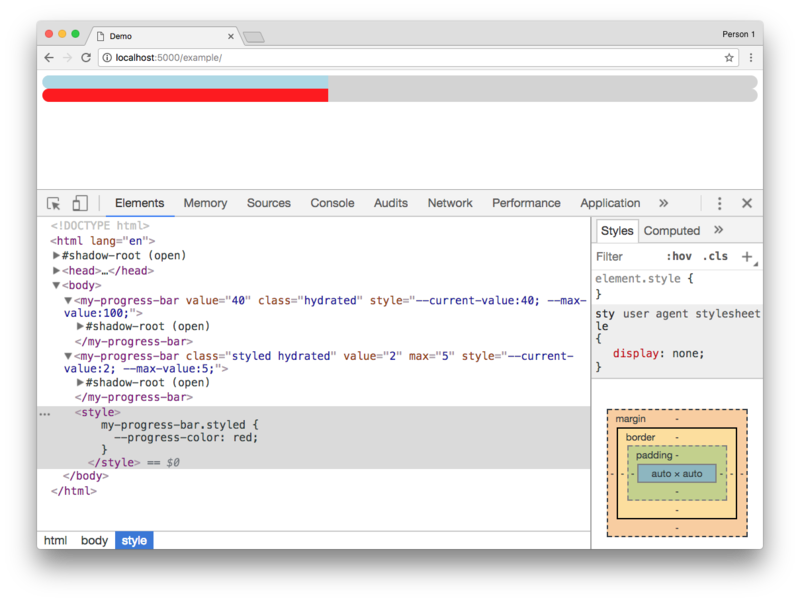 If a browser doesn’t support the Shadow DOM yet, Stencil will make sure to use the respective polyfill. Inside the MyProgressBar class we have one method called render() that is responsible for determining what the custom element should render. For this we are using JSX annotations. In our first attempt we’ll just render a headline. The :host is part of the Shadow DOM and makes sure that the styling of h1 won’t leak to the outside. Compile your web component by running npm run build in your command-line. You should see a new dist/ folder being created with a variety of files. We’ll talk more about them later. For now all we need to know is that dist/my-web-components.js is the file we want to use if we want to consume our new component. The main difference is that attributes only allow you to pass “primitive” data types while properties allow you to pass rich data like arrays or objects. Stencil, however, is smart enough to do a bridge between the two for primitive data types. Meaning that if you set a value via an attribute, it will forward it to the respective property. Any property of the class that is prefixed with the @Prop() decorator will be turned automatically into a property on the custom element. Stencil will also watch any changes in this value and will cause a re-render by calling render() again. We also updated the code that is rendered to show the two values. So far we have a pretty boring web component and it’s nowhere near a progress bar. To change that we’ll have to do a few changes to our CSS. In this code we use var(--some-value, fallback) a few times. This allows us to read the value of a CSS custom property and specify a fallback in case it doesn’t exist. --current-value and --max-value are the two we’ll use from our component while the others can be used by the developer for styling. So every one of these files is important depending on the scenario and therefore we’ll just publish everything. If you want to know how you can use these components in Angular or React, make sure to check out the documentation on stenciljs.com. This was just a very basic web component to show the general concepts. If you want to build more complex components you should make sure to check out the Stencil website as it provides information on state management, events, methods, forms and even server side rendering. If you want to start using web components in your framework of choice, I recommend you check out custom-elements-everywhere.com. It’s a website that constantly tests the support of custom elements in a variety of frameworks and highlights the existing issues if there are any. Stencil is also not the only way to author web components. Others include Polymer, SkateJS and others. Also existing frameworks are looking into how you can turn your existing components into custom elements. Angular is working on Angular Elements and Vue Elements allows you to develop custom elements in Vue.